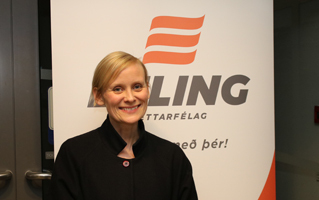 Sólveig Anna Jónsdóttir will be the next chairman of Efling union and will she take over from Sigurður Bessason, retiring chairman, at the annual general meeting of the union next April 26. B list of Sólveig Anna got 2099 votes and A list of the board of Efling and the board of representatives got 519 votes. The candidates on the B list with Sólveig Anna and are going to take seat in the board of Efling are Magdalena Kwiatkowska at Café Paris, Aðalgeir Björnsson, at Eimskip, Anna Marta Marjankowska at Náttúra þrif, Daníel Örn Arnarsson at Kerfi, Guðmundur Jónatan Baldursson, driver at Snæland Grímsson, Jamie Mcquilkin at Resource International ehf. and Kolbrún Valvesdóttir, employee at Reykjavík residential services. On the voters´list were 16.578 members and of them there were 2.618 that voted. B list of Sólveig Anna got 2099 votes. A list of the board of Efling and board of representatives got 519 votes. Blank votes were 6 and invalid were 4. There were two lists of candidates in the election of board members for Efling Union. There are eight candidates on each list, they are as follows: Chairman, Treasurer and six members. There are 15 members on the board, eight of them are elected this year including the chairman.